Homestead Land Company, Inc. was incorporated in 1993 to provide service to local lenders in the appraisal business. From here, we evolved into Real Estate Sales, Auction, and Farm Management. There was (and still is) a need to provide appraisals to lenders in a timely manner for lending purposes. Appraisals are provided to lenders, attorneys, accountants, individuals, or anyone needing to know the value of real estate. These needs include estates, estate planning, sales, property division, tax issues, assessment issues and more. Eldon Ideus (Licensed Appraiser), Tyler Rosener (Certified General), and Michael Zarybnicky, (Trainee Property Appraiser) do the majority of the appraisal work. We specialize in selling farm real estate. Auctioning or listing farmland is a very large part of our business. Our salespersons have farm backgrounds and understand farms. Dave Bures, auctioneer, is very experienced in selling real estate, along with personal property. 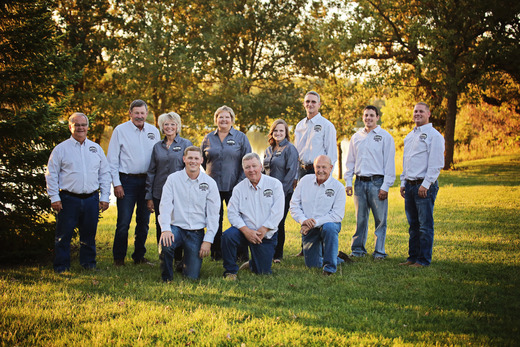 Randy Fischer, Eldon Ideus, John Riha, Craig Zarybnicky, and Tyler Rosener all have considerable farm/rural experience and are licensed salespersons. In addition to selling farmland, Homestead Land Company, Inc. is involved in Listing and Selling rural building sites, residential properties and commercial land and properties. Our residential team of Patti Behrens, Craig Zarybnicky, John Riha, Dave Bures, Tyler Rosener and April Stone. The team brings great experience in todays real estate market. Real Estate Agents have a reputation of telling potential sellers unrealistic values for their homes just to obtain a listing. “Just get the listing and work them into reality later”. We don’t use that tactic at Homestead Land Company. Our listing presentations provide you with the best possible information to provide you with a realistic value of your home. We also provide the same expert advice as Buyer’s Agents. Our experience can help you find your dream home. Whether a Sellers Agent or a Buyer’s Agent, we know who we are working for. Let us sell your home, or help you find that dream home. Do you own a farm, or do you have farmland as part of your investment portfolio? Are you renting out the family farm? Farming is a very complex enterprise. Who is looking out for your interest?